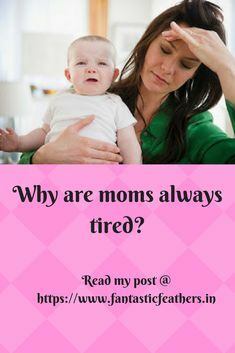 Fantastic Feathers: Why are moms always tired? Recently, I was discussing with my friend why I am looking tired most of the time and this triggered me to write this post. I am a mom of 2 boys aged 6 and 2. I left my job due to relocation and I thought, I will have more free time to rest :-) I have realized, it's not true. Though I used to work with 2 kids earlier, I had some support from parents, in laws and house help. The summer holidays are over for children in India, but in the USA, we still have to survive around 20 more days until children start going to school. So, it is really tough since last 2 months to engage kids and also manage household activities. Engaging a 6-year-old is not a big deal but handling a toddler will take up more energy. Why are moms of toddlers always busy? I try many ways to engage my kids. I read them books, teach them house hold works, give them time for free play, take them to park/ library/ movie/ museum/ friend's house, plan an outstation trip at least once every 15 days. I also sit with them and help in painting, creating crafts (and cleaning the mess afterward :)) , teach them our mother tongue and tell them nice stories. When I am dead tired, I allow them to watch Tv and play games on the tablet (No guilty conscious there, as this is the last option). Now, tell me, how much energy does these coordinations require? This is one of the first reason for my tiredness. Running behind toddlers is super tough, I say. My 2-year-old does some or the other naughty thing in a blink. Once, he applied Vicks Vapourub to his hair when I was busy with cooking. He explores all the corners of the house and sometimes tries his hands on glue and crayons. Sometimes, he simply scatters all his building blocks. So, running behind him and cleaning the mess takes more energy. I read hundreds of articles on how to cook and feed healthy food to children. I am not a good cook and also don't enjoy cooking. I mostly rely on youtube. To add to my problems, my younger one is a fussy eater. I can't blame his age. He is more interested in playing with his toys than focusing his energy and skills on learning to eat. I have to wait one more year to escape from this problem. I feel bad to say this. But, I have to agree that I am ignoring my health. I am not eating food at the right time(I am trying hard to eat lunch at 12.30 itself and start feeding my kid later even though my heart won't allow). I think I have to focus on my diet and concentrate on rich protein food. I say this to myself many times and I know this cannot be an excuse for tiredness. 'Me time' is essential for my happiness. But I have to sacrifice a few things to get that free time for my hobbies. It leads to less sleep and not having enough rest. So, these are some of the factors that keep me busy and tired. Do you also feel the same way? What do you do to keep your energy levels high and be healthy? Please share your tips in comments. Truth in each line .Toddlers are tricky .You need to take care of health though. Its never easy for a mum, thats why I secretly love going to work. Keep writing to maintain your sanity! and remember this too shall pass- they all grow up! Hopefully we mommies remain sane!